I’ve come rather late to the podcast party, although my good friend Lucy has often sung their praises. Before my longish train journey north I decided to finally download a free podcast app (Castbox, which works well on my Samsung Galaxy S6) and then went on the search for some interesting things to take with me and listen to. It’s been quite a revelation. I’ve never found it easy to read on the train, but putting on headphones and listening, cutting out all the stupid conversations or noises around me, and still able to watch the countryside going by, was perfect. And back home I find it’s a fine companion in the kitchen when cooking. For someone who rarely finds radio output of any interest, it’s amazing how I’ve taken to this. My all-out favourite is the New Yorker Poetry podcast, in which a guest poet discusses someone else’s poem, then reads it, followed by conversation and a reading of one of their own poems. The host until last October was Paul Muldoon who I find perfectly suited to the medium. His voice is wonderful to listen to and the conversations he has with guests are fascinating. He’s always careful not to either talk down to the listener nor to exclude us. Each monthly edition lasts about half an hour and they go back to 2013 so there’s a rich archive to enjoy. So far I’ve heard Andrew Motion reading Alice Oswald, Eileen Myles reading James Schuyler and Nick Laird reading Elizabeth Bishop. One funny thing is the odd advert – presumably added automatically by the software as they sometimes pop up in the middle of a sentence (but not, so far, a poem!) To be fair I’ve only noticed one or two per episode, and they’re very brief. We’re not talking commericial-radio-time-to-make-a three-course-meal-style ad breaks. 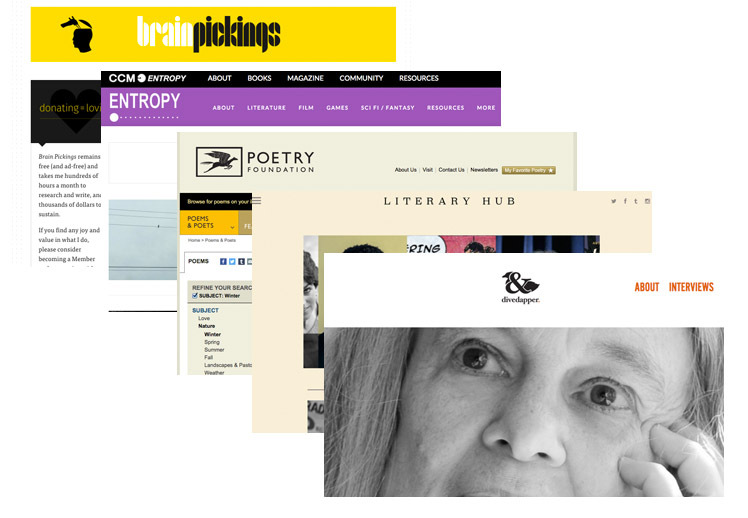 Then there’s the Poetry magazine podcast, co-hosted by Don Share and Lindsay Garbutt or other members of the editorial team. I’ve no idea why I’ve never explored this one before. When Poetry comes through the post I love the fact that you open and and you’re straight into the poems – no editorial or anything else forming a barrier between the cover art and the inside art. But I do sometimes think I’d like some sort of commentary, background or insight into the editors’ choices. The podcast description is ‘The editors go inside the pages of Poetry, talking to poets and critics, debating the issues, and sharing their poem selections with listeners.’ It’s short (under 10 minutes), frequent (weekly) and to the point. And again – great voices and high quality production. All of which makes it a pleasure to listen to, and most importantly allows the content to shine through. 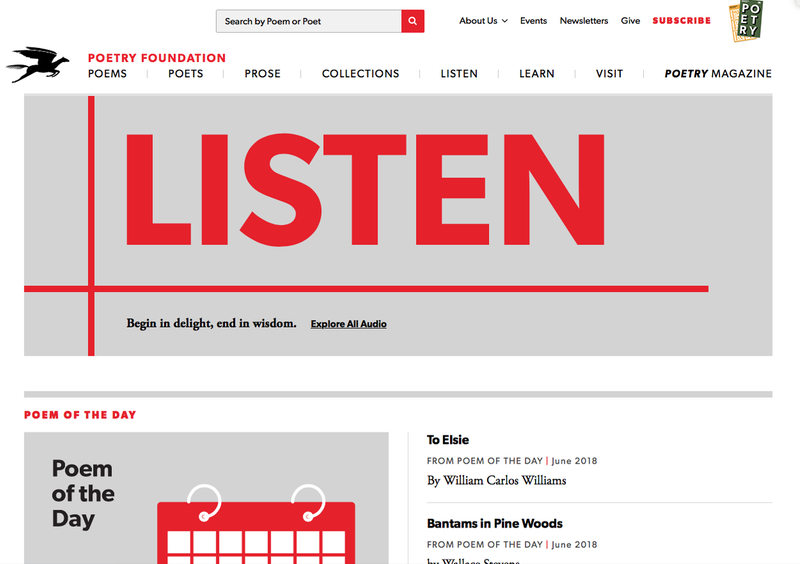 The Poetry Foundation (which publishes Poetry) has a number of related podcasts, including Poetry Off the Shelf which ‘explores the diverse world of contemporary American poetry with readings by poets, interviews with critics and short poetry documentaries.’ Lots to discover here. There are other podcasts I haven’t yet really assessed yet but have subscribed to, such as the Scottish Poetry Library podcast which appears also to have been going for some years, each episode a conversation with an individual poet, incorporating them reading some of their work. The UK arts charity Poet in the City also puts out a podcast, albeit infrequently (two or three episodes a year) but an interesting mix of ‘performances, reflection and debate’. The Poetry Society podcast features ‘both readings by poets and the fascinating exchanges between editors of The Poetry Review and contributors, past and present, as they explore ideas and themes generated by the issue.’ One podcast I have listened to before occasionally is The Transatlantic Poetry Pondcast (sic) produced by Robert Peake, which brings together UK and US poets for live readings and debate – the live element is exciting. There are tons more I’m sure, but I don’t want to enter overwhelm too soon. I’ll probably subscribe to loads of channels and end up just going back to a small number. I’m already getting a feel for differing production standards – sound quality for example. Just saying! This is super-helpful, Robin — many thanks. A brilliant idea for trips. I’ve been a bit daunted by the whole world of podcasts, so this is a good doorway.